If your stomach can handle it, it’s great to have a small pre-workout snack before you head out for a run. Mix protein and carbs. A couple ideas: banana with peanut butter or maybe an egg on a piece of toast. A rule of thumb is that if you’ll be running for more than 45 minutes to an hour, you’ll want to consider fueling during your run. Why? Your body stores glycogen for quick-access energy, and those glycogen stores are usually used up after about 45 minutes. I’ve been a Gu fan for awhile. Espresso Your Love is my favorite flavor – it’s got the caffeine too! I usually do my long runs in town, so I am running by garbages often. Last fall on a trail run, I headed out with my water, tunes, and Gu. With no garbages in sight, I put my used Gu packets back in my running belt. And proceeded to have a huge mess. So – rule of thumb, if you like Gu and don’t have an abundance of trash cans on your route, bring a little baggy to put your used Gu pouches in. I promise it’ll be less sticky that way. A much more affordable, less “technical” option is to take fruit snacks. Most pouches are around 80-100 calories, and will indeed restore your glycogen stores, not that much different than some of the options that are marketed to endurance athletes, in my opinion. No, they don’t have added caffeine or electrolytes, but they’ll get you by. 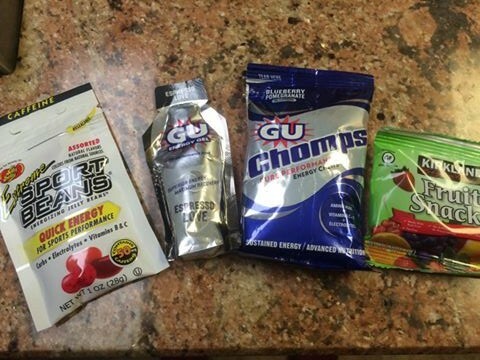 For my runs that are over 2 hours, I’ll use a Gu packet AND a fruit snack packet. Yes, I’m that frugal. Others that I’ve been trying out include Chomps, Shot Blocks, and Sport Beans. Another rule of thumb – don’t try new fuel during a race, especially one where you’re really pushing yourself. Your stomach is likely already nervous just from the race, and you have no idea what a new source is going to do. My example: gummy bears at the Portland marathon a few years ago. If a couple tasted good, then a few would be better, right? Wrong! If you don’t want to carry your fuel during a race, then find out ahead of time what that will be and use that fuel during your training. That leads me to liquid with fuel (e.g. Gatorade or an equivalent). Hydration is a topic for another day, but there’s also the option have having hydration with calories to restore your glycogen as well. If you try Gatorade or an equivalent and it doesn’t sit well with your stomach, try alternating water, then Gatorade or diluting it. My personal preference is not to use liquid, only because I don’t want to have to carry it with me (vs. something you can throw in your waist pack). There’s other options for you: -Plant bottles of Gatorade (or water) on your route -Map your running route so it keeps looping back by your house. Refuel, rehydrate, shed layers without carrying anything extra, and you’ve got access to a clean bathroom too! Finally, there’s the post-run fueling. A glass of chocolate milk has been suggested as the “ideal” nutrition because of it’s carb to protein ratio, and probably because it’s pretty tasty. As someone who avoids dairy, I will typically have a shake (vegan chocolate Shakeology with water, ice, banana, and cinnamon out of the blender is my current favorite), but sometimes it’ll be a banana with almond butter or another equivalent snack that has a protein/carb mix. Your muscles worked hard, make sure you give them fuel to recover. Caveat: if your run was less than a couple hours, be careful on the nutrition overall – you do want something in your system so you have energy for the workout, but if you’re looking at maintaining or losing weight, it’s not that hard to end up consuming more calories than you just burned! Kelly Goforth, a 1995 Menomonie High School graduate, lives in Oak Park, IL with her two daughters and husband, Scott. While she’s been active her whole life, Kelly recently made significant changes to her nutrition and workout routine, and her dedication delivered significant results! Kelly shares her knowledge with others through her Beachbody coaching and her “Goforth and Be Healthy” Facebook page. Click to email Kelly your fitness question.